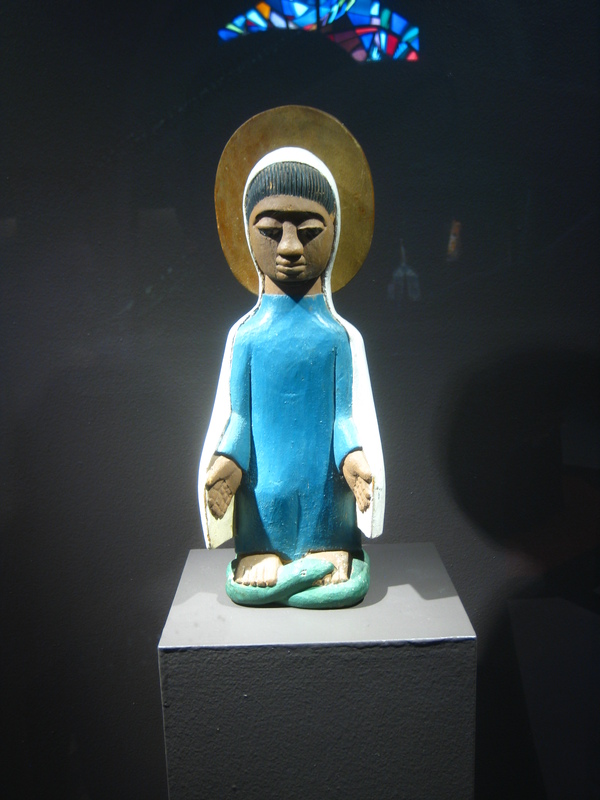 Through July 30, 2014, the African Art Museum of the Society of African Missions is hosting an exhibition called “Africanizing Christian Art,” curated by Nicholas J. Bridger. About a half-hour drive from New York City, the museum is located in Tenafly, New Jersey, the American headquarters of the SMA (the acronym is taken from the Latin Societas Missionum ad Afros). It is one of five museums maintained by the organization worldwide, the other four being in France (two), Italy, and the Netherlands. I had the privilege of viewing this special exhibition two weeks ago. It focuses—though not exclusively—on the legacy of Father Kevin Carroll and his artistic collaborations with the Yoruba people of Nigeria. These collaborations began in 1947, when Carroll was recruited to the position of manager of the newly formed Oye-Ekiti Workshop, founded by the Rev. 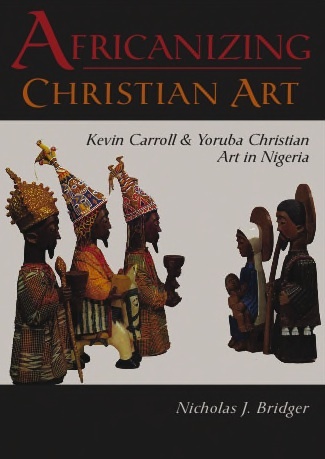 Dr. Patrick M. Kelly with the aim of developing a new Yoruba Christian style of art. The Holy Family. 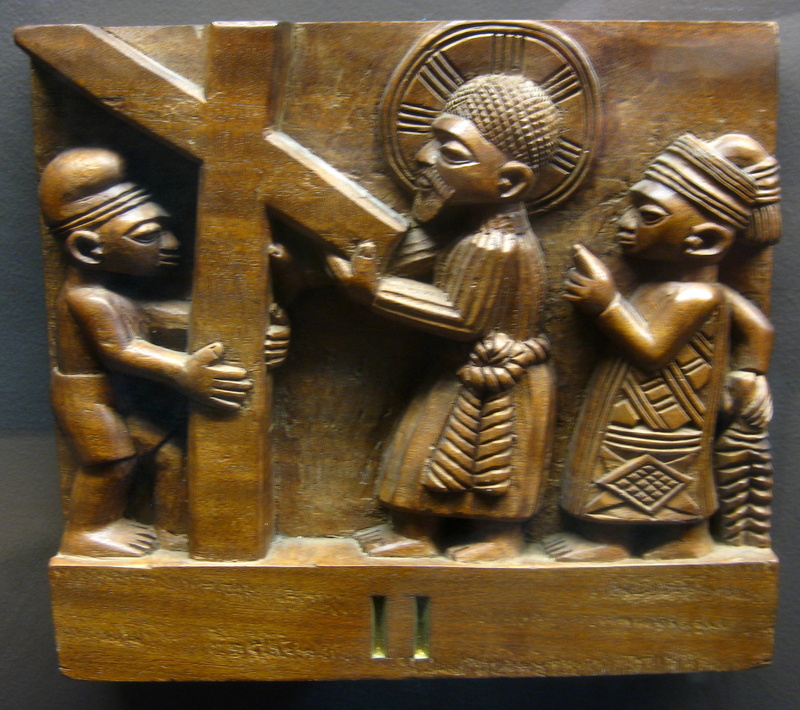 Part of a crèche set carved by Yoruba artist Joseph Imale in 1974, with beadwork by Jimoh Adetoye. Collection of the SMA African Art Museum. Photo: Eric James Jones. To view the full set, see page 2 of the SMA sculpture guide. Kelly deliberately chose to establish the workshop in a rural location—the town of Oye in the district of Ekiti—so as to mitigate the Western influences that would have been strong in the colonial cities. Unfortunately, the workshop could not sustain itself long term: it was shut down by an SMA superior in 1954 on the grounds that it was no longer financially viable and was an unacceptable drain on SMA funds. Bridger suggests that its failure was due to a lack of effective public relations, education, and marketing within both the SMA and the broader Nigerian Catholic community, roles that Kelly had hoped to assign to an additional staff member, but one was never found. Despite its short run, the Oye-Ekiti Workshop accomplished much. Under Carroll’s leadership, a handful of Yoruba artists—some already well known, some up-and-coming—successfully adapted local art forms to the expression of Christian ideas so that Christ and his gospel could be more easily recognized by a West African audience. Bridger asserts that “the art of the Oye-Ekiti Workshop deserves recognition for epitomizing the blooming of the Christian message on Africa’s soil and for heralding the global realignment of Christianity toward the Southern Hemisphere in the third millennium of the Common Era” (99). 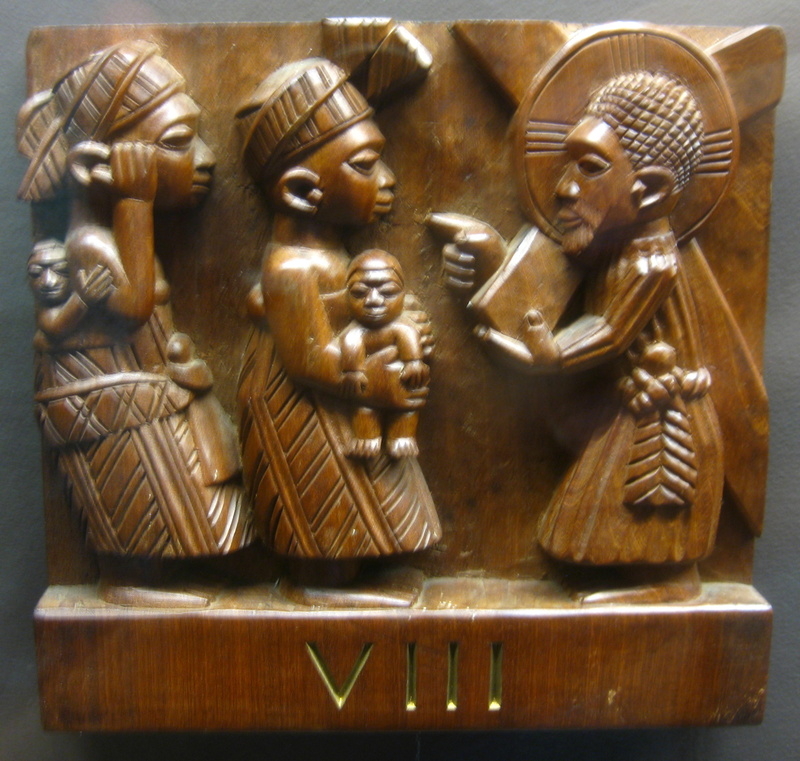 Below is a sampling of works from the “Africanizing Christian Art” exhibition. 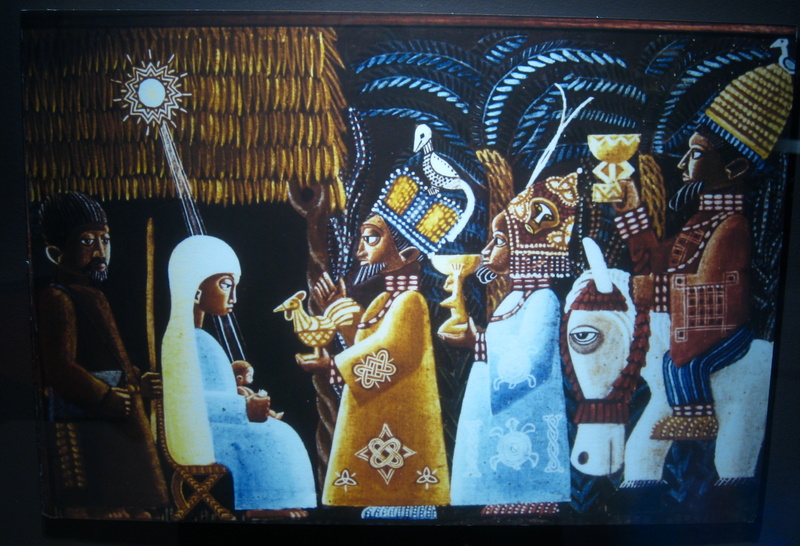 This painting by Father Kevin Carroll was likely the prototype for the Africanized nativity sets made by the Yoruba carvers of the Oye-Ekiti Workshop. (Compare it, for example, to the set made by George Bandele in 1949.) The Three Kings are clothed in the regalia of Yoruba obas: they wear beaded crowns (ades) on their heads and robes made of embroidered West African textiles. But what is most significant about the painting is not the skin color or the dress of the Three Kings, it’s what they carry: ritual objects from their domestic and religious lives. Carroll seems to be suggesting here that “Yorubaland’s indigenous belief system provides fully worthy spiritual gifts for the Christ Child,” as Bridger puts it (49); the Yoruba people can, and must, use their culture to worship him. 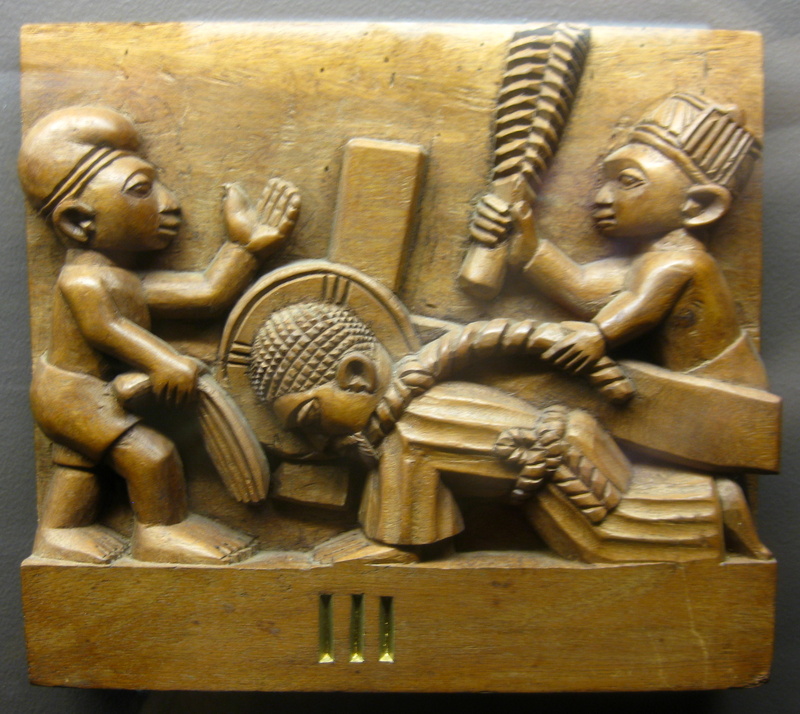 The first king bears an olumeye, a container used for holding kola nuts. In Yoruba homes, these caffeine-containing treats are shared with guests as a gesture of hospitality and friendship. Here they signify the king’s welcoming Jesus into the world. The rooster, a popular motif in Yoruba art, foreshadows Jesus’s sacrificial death, as the rooster is one of the most common animal offerings made to the gods (orishas) in the Yoruba sacrificial system. The second king bears an agere Ifa—yet another nut-storage container, but one that’s intended for palm nuts. 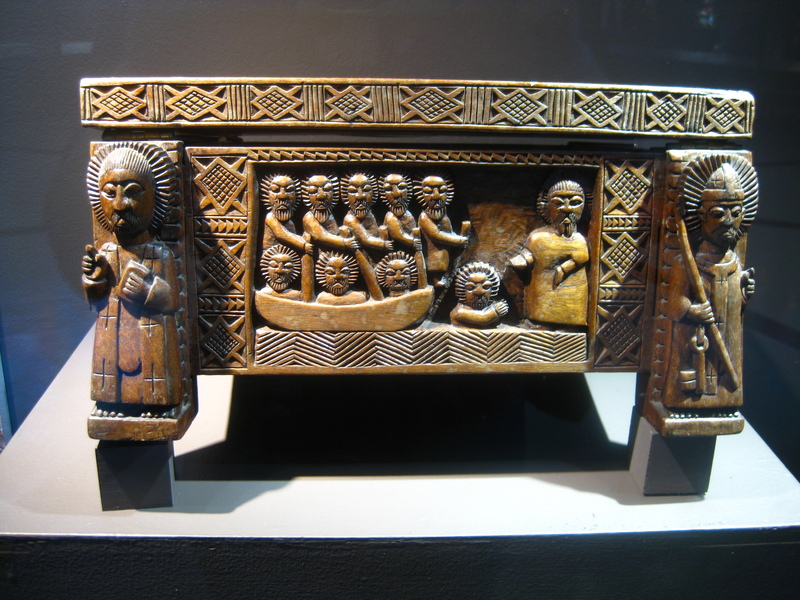 Practitioners of Ifa, the traditional religion of the Yoruba people, vest palm nuts with sacred significance: they are used to consult Orunmila, the orisha of wisdom, in a divination rite that involves an Ifa priest (babalawo) casting sixteen of them onto a tray and discerning which signs they display. By approaching Jesus with an agere Ifa, the king in the picture acknowledges Jesus as priest, as one having special access to and communion with divine wisdom and therefore the ability to speak truth into any life situation. Carroll didn’t mean to suggest that Ifa was an all-sufficient means to God but rather saw Ifa as a system that had prepared the Yoruba people to receive the full revelation of God in Christ. Their belief in things like a spirit world, divine intervention, the necessity of sacrifice, the importance of community, and their practice of virtues like hospitality, could be used as bridges, points of crossover, to the gospel. Some of their religious practices would need to be redirected and amended, but surely their impulse to connect to a higher power is God-honoring. Carroll wished to show the Yoruba people that converting to Christianity did not require a conversion to European culture, that God was pleased with the praise they offered him in their own culturally authentic forms. Carved missal stand (tabor) by George Bandele, ca. 1950. Kevin Carroll Collection, Dromantine, Northern Ireland. Photo: Victoria Emily Jones. To view from another angle, click here. George Bandele Areogun of Osi-Ilorin (1910-1995) was the workshop’s most prolific artist and indeed was its backbone, having joined in its second year and fulfilled dozens of commissions on Christian themes. 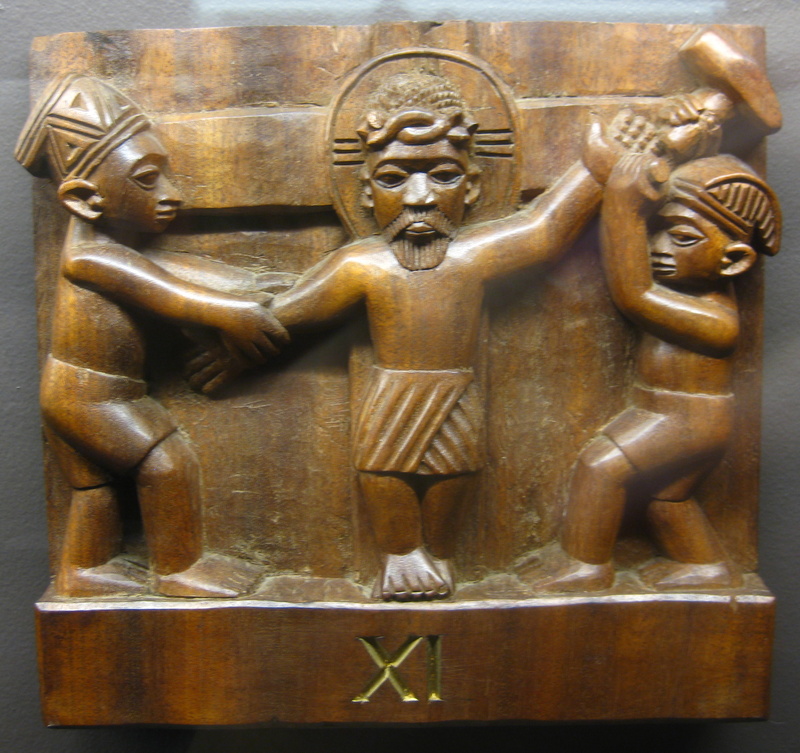 Son of the famous carver Areogun (1880-1954), Bandele attended Mass as well as traditional Yoruba religious gatherings. Around 1950 he carved a missal stand depicting a scene of Christ walking on the water—and Peter sinking—on the front face. 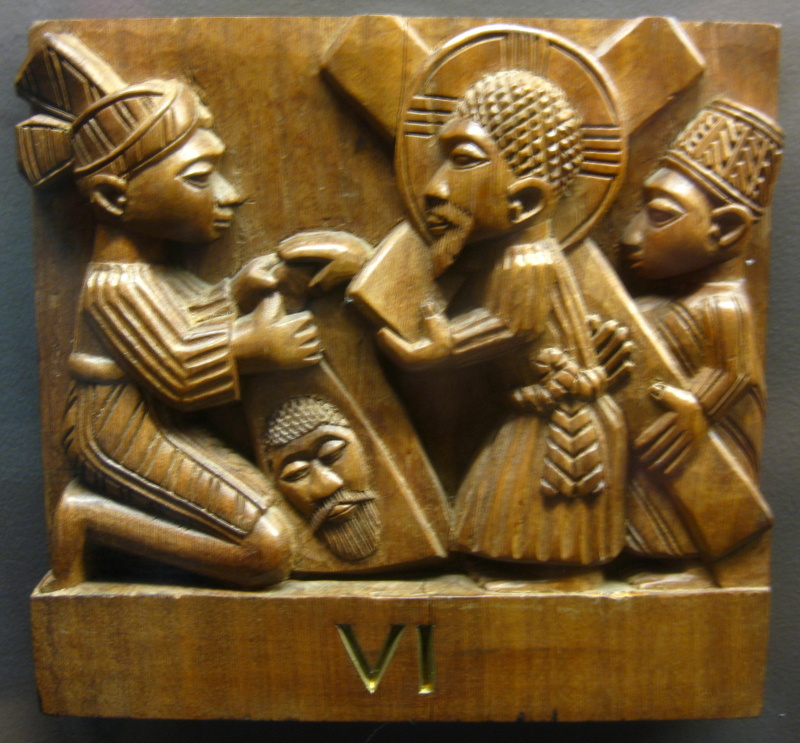 The other three sides show Christ giving the keys to the Church to St. Peter; the Good Shepherd; and an unidentified scene. 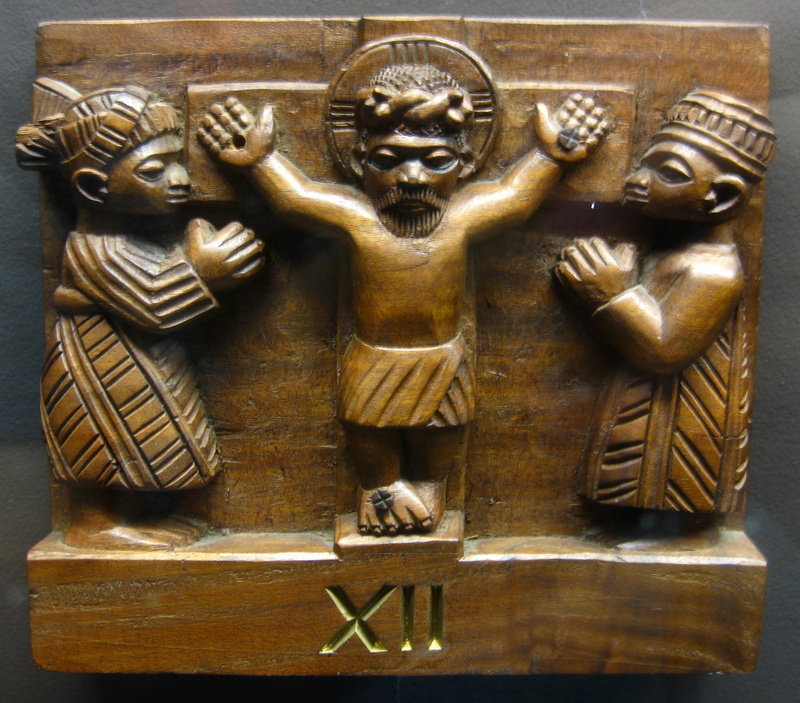 Catholic saints stand at two of the corners, and Yoruba orishas stand at the other two. A missal in Roman Catholicism is a book containing all the prayers and devotions for celebrating Mass throughout the year. This stand, or lectern, would have been situated on the altar at the front of the church, just in front of the priest. 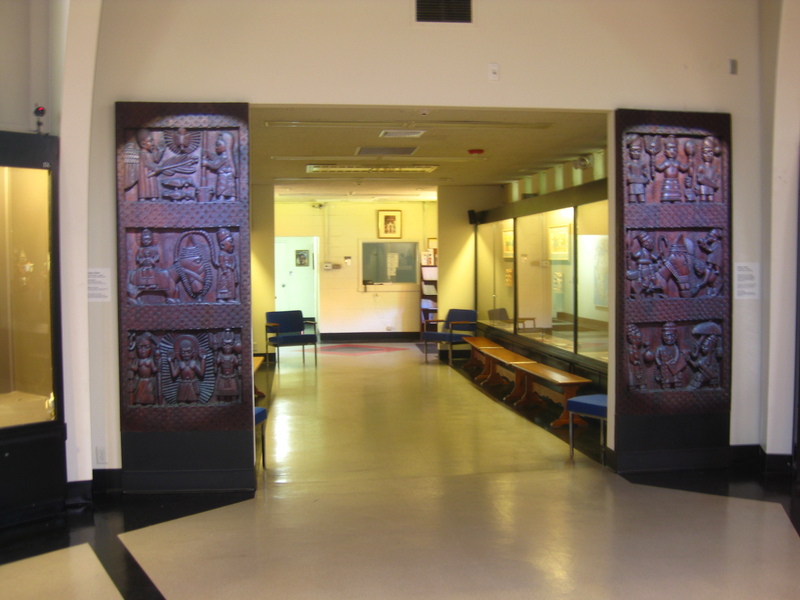 Most of the panels represent scenes from everyday Yoruba life—men mounted for battle, Ifa priests performing ceremonies, women doing chores, scholars with their books—but one door displays three scenes from the life of Christ: the Annunciation, the Flight to Egypt, and the Transfiguration. Carved wooden door by George Bandele, 1964. 84 inches tall. 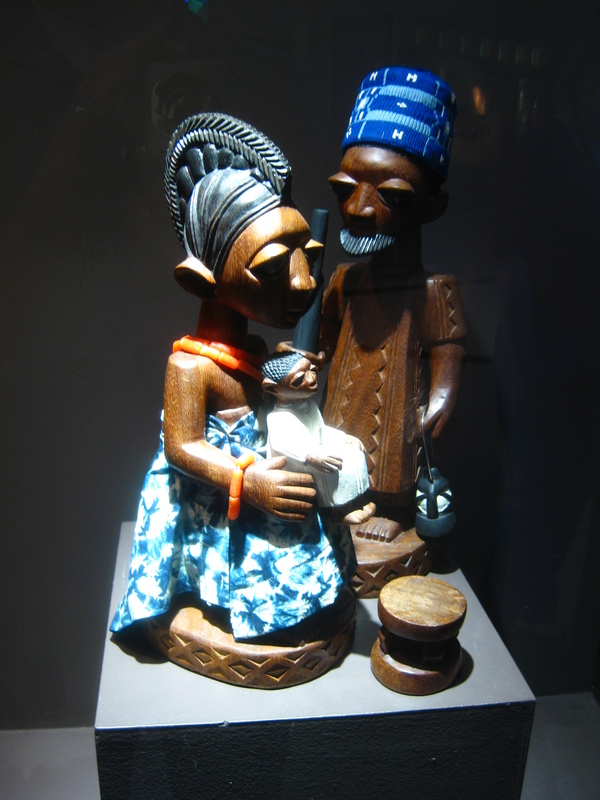 Collection of the SMA African Art Museum. In traditional Western art, Annunciation scenes show the angel Gabriel extending a lily or an olive branch to the young Mary, who is either reading a prayer book or weaving. But here Gabriel extends a kola branch, a tree indigenous to Yorubaland, and catches Mary at work pounding yams in a mortar, a daily chore in Yoruba households. 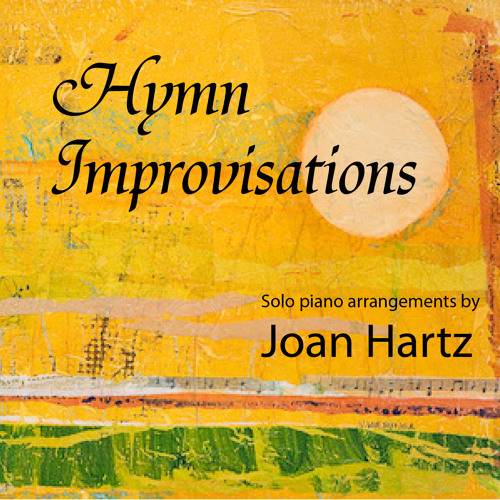 Two chickens play at her feet, and the Holy Spirit in the form of a dove sweeps into the room from above. This is the moment when she finds out that she will conceive the Son of God. 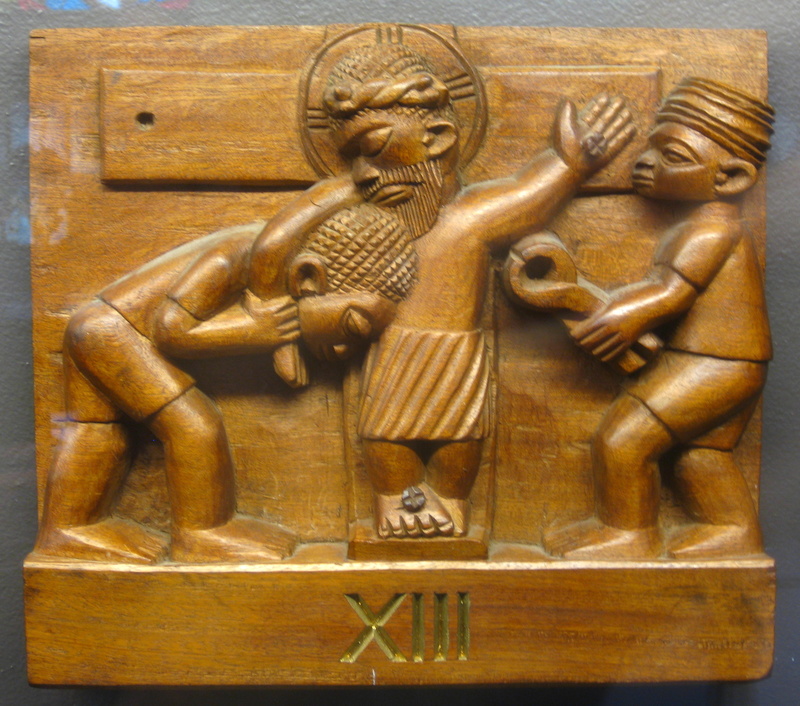 The Transfiguration scene that fills the bottom register likewise draws on Western visual traditions while making the event relevant to the Yoruba people. Instead of showing Christ in glory between Moses and Elijah, who represent the law and the prophets, respectively, Bandele puts him between a priest of Osanyin (the orisha of healing) and a priest of Shango (the orisha of thunder and lightning). 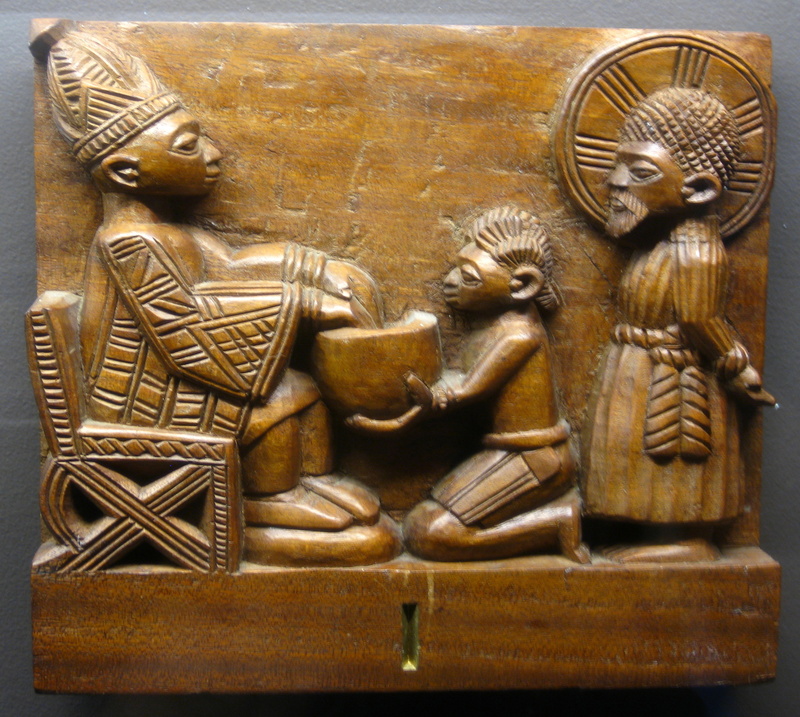 The priest of Osanyin, on the left, holds a wrought-iron staff surmounted by birds, and a long horn that holds medicine. The priest on the right holds a Shango dance wand (oshe)—recognizable by its double-blade ax—and a rattle (shere). Just as God used Judaism to pave the way for Christianity in ancient Palestine, could it be that he has also used Yoruba religion to pave the way in that region, for that people? George Bandele, Virgin Mary, 1960s. Wood and pigment. Collection of the SMA African Art Museum. Photo: Eric James Jones. I’m not often moved by Marian art, but I love this simple sculpture that shows her standing on a serpent, as if to say, “Evil/Satan/sin/death, you have no power over me! I will not fear you!” Her eyes are turned down in humility, her arms open in grateful surrender, as she ponders how hers is the victory through her son Jesus the Christ. I’m impressed by how Bandele managed to convey so much thought and emotion in her eyes. Power and victory are hers, yes, but it’s a quiet confidence that she expresses, and one tinged with sadness. The cost of her salvation and that of the world was the life of her precious boy. Lamidi Olonade Fakeye of Illa-Orangun (1925-2009) was recruited to the Oye-Ekiti Workshop in 1948 and served a three-year apprenticeship under Bandele. Though Muslim, he was happy to have the opportunity to learn from a master carver, and he became a very important member of the group. 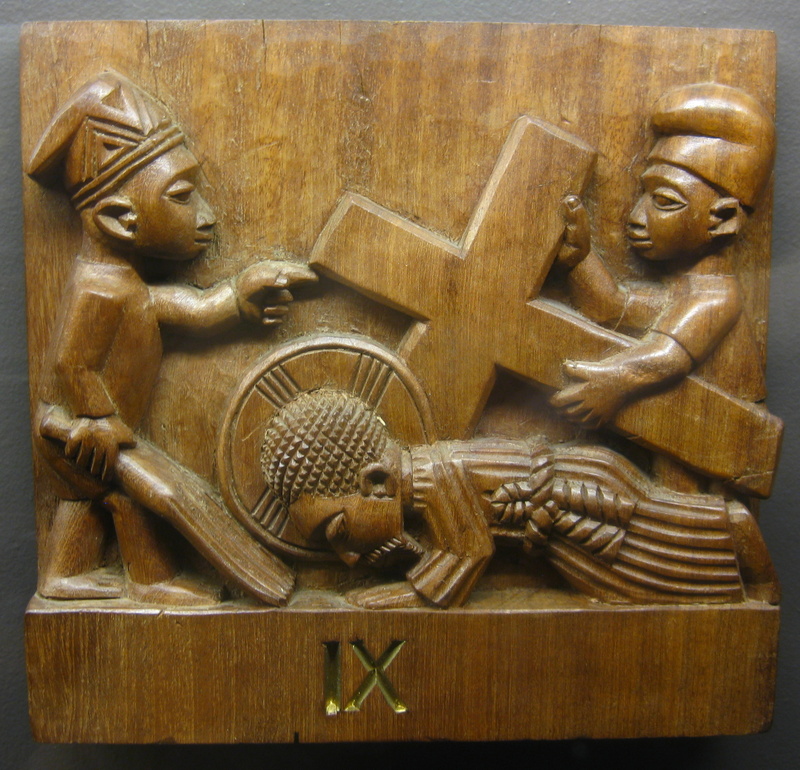 The exhibition in Tenafly includes fourteen wooden panels by Fakeye depicting the Stations of the Cross, a series of devotions that developed in the thirteenth century to guide Christians in their meditations on Christ’s final hours. 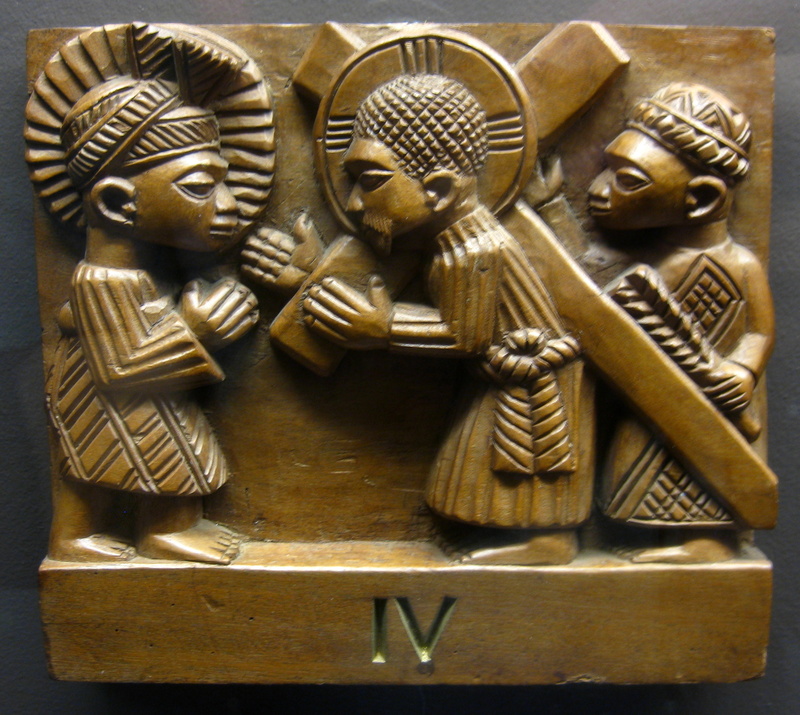 In Fakeye’s version, Christ is unmistakably African, as are the women he meets along his way to the cross. I really admire Father Kevin Carroll’s commitment to affirming and preserving the good and the beautiful in Yoruba culture; at the time—pre-Vatican II—this approach to mission work was radical, and he certainly encountered a lot of resistance from fellow Catholics. But he persevered, continuing on informally in his collaborations with the local artists he had befriended in Ekiti long after the workshop was shut down. The SMA honors the legacy of its former member by continuing to be active in raising public awareness and appreciation of African cultures, as is evident from its permanent art collections, which comprise about 3,000 works at the Tenafly location alone. The venue is quite small—a short hallway with a dome-shaped room in the middle—and so the works are exhibited on a rotating basis. Some of them come from missionaries, some were specially commissioned, some are donated by private collectors, and some are purchased from dealers. Nigeria is of course not the only country represented: there are also works from Ghana, Ethiopia, Liberia, Mali, Burkino Faso, the Congo, and more. Not all the works represent an African-Christian hybrid; in fact, most of them depict traditional African subjects, or are nonrepresentational artifacts, and show no missionary influence. 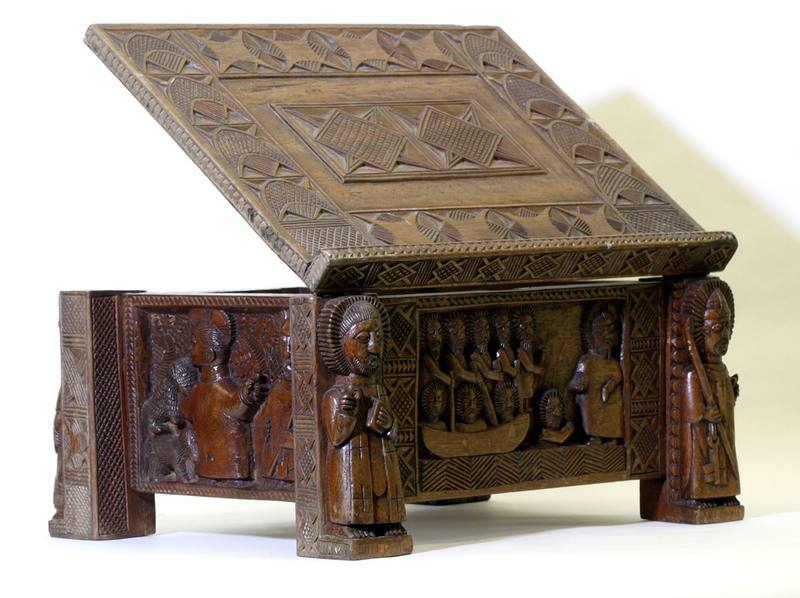 To view other carved works from the SMA collections, click here. To read a profile of the museum published in 2010 by the New York Times, click here. If this post piqued your interest, I highly recommend that you purchase the book Africanizing Christian Art, which I’ve quoted from throughout. You can do so via PayPal from www.AfricanizingChristianArt.com for $34.95 plus $6.50 for shipping and handling. Its quality is all-around superb: the research, writing, editing, photography, design, production—everything. It’s a 152-page hardcover printed in full color on glossy pages, worth every penny if you’re into non-Western Christian art like I am, or if you do ministry among Africans. You could also buy a copy at the museum—but you may want to call first, especially if you want to pay with a credit card. When I visited, no one was there, and I had to slip some cash through an office window! 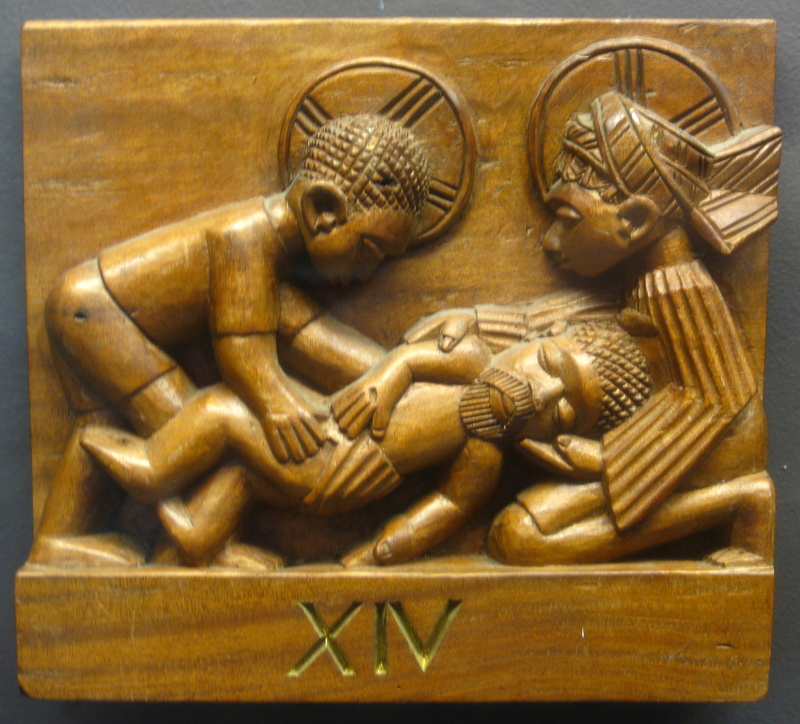 This entry was posted in Non-Western Art and tagged adoration of the magi, african christian art, african nativity, african stations of the cross, black christ, father kevin carroll, george bandele, ifa divination, lamidi fakeye, society of african missions. Bookmark the permalink. I have only just seen this post and heard of this exhibition, however, your pictures may just have helped me trace more information on a piece that Kevin (who was my uncle) gave to my mother many years ago. 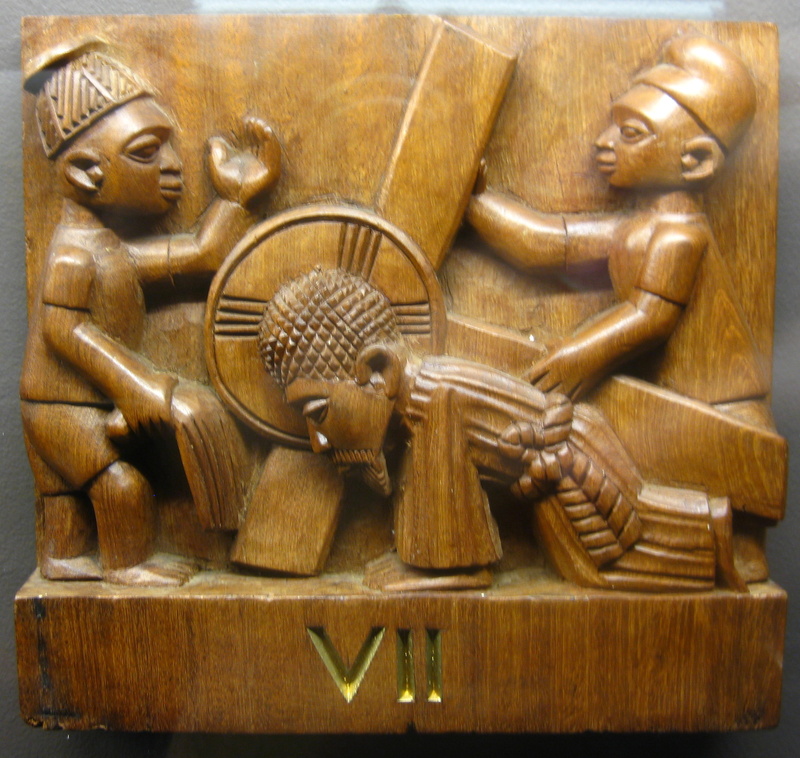 Since a child, I’ve remembered a wooden Yoruba carving in my mother’s house and, looking at the first picture above, I now believe it was by the same artist, Joseph Imale. Are you aware of any more pictures of pieces by this carver? 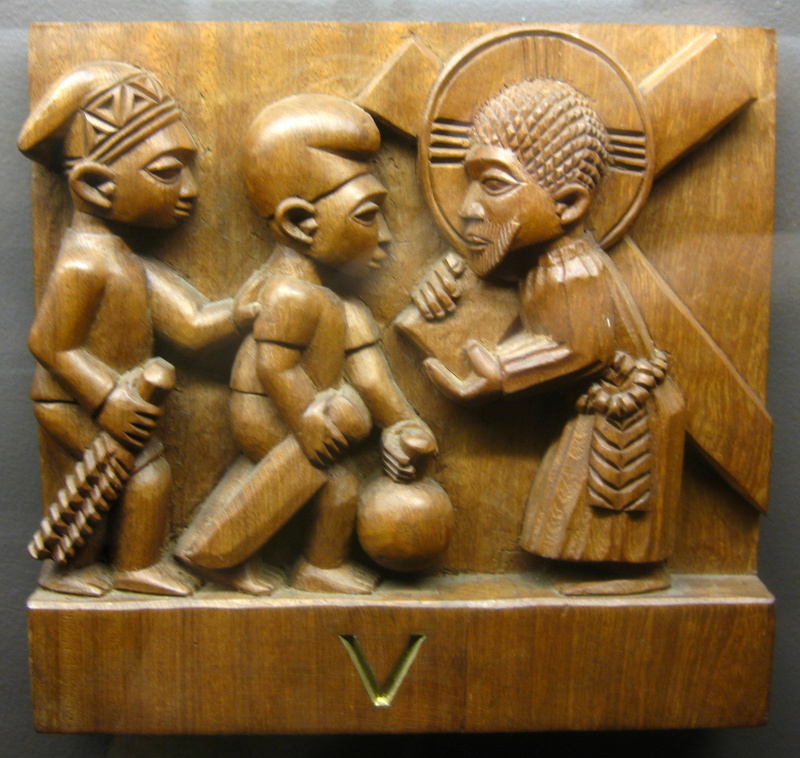 I did some investigating and found that the book CHRISTLICHE KUNST IN AFRIKA calls this same artist Joseph Agbana, and it has a few pages of photographed works by him–Holy Family sets and carved doors, as well as a photo of him with Carroll (I can e-mail you scans if you’re interested). 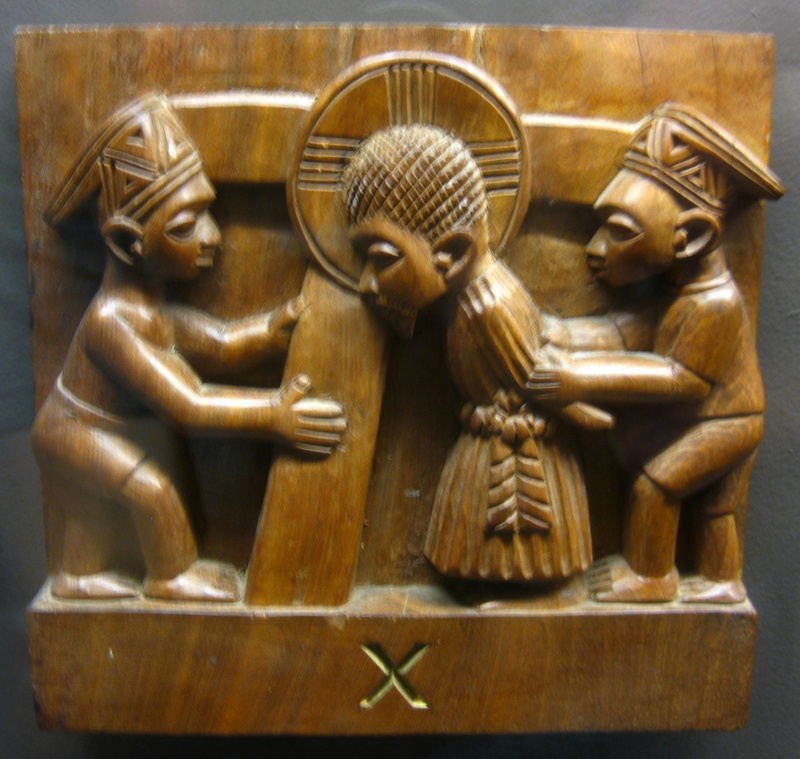 Bridger says Agbana was “Carroll’s favorite Yoruba carver in later years”; that he created panels on the familiar Gospel themes but with a broader range of Nigerian ethnicities present; and that (as of 2012) he and his son continue to carve in both the Yoruba-Christian and the Neo-Traditional styles in their studio in Inisha. The SMA sculpture guide I linked in the topmost caption identifies the artist as “Joseph Imale, son of Roti, the Agbana (king) of Osi IIorin” and has some additional photographs.